This artist's rendering (not to scale) shows a cross section of the Earth's magnetosphere (the protective shell created by the planet's magnetic field). The magnetic-field lines are in blue, and the solar wind is in yellow. For the first time, the bright, shimmering auroras that dance across the sky have been directly linked to specific disturbances in Earth's magnetic field. "These observations reveal the missing link in the conversion of magnetic energy to particle energy that powers the aurora," Evgeny Panov, a researcher at the Space Research Institute at the Austrian Academy of Sciences in Gratz and lead author of a paper reporting the connection, said in a statement from NASA. "We were delighted to see such a strong match." The beautiful auroras that have long captivated human interest form when charged particles from the sun are caught in Earth's magnetic field. Most of the materials streaming from the star are deflected by the planet's magnetosphere (the shell that the magnetic field creates around Earth), but during events known as substorms, some solar particles make it through the protective shield. 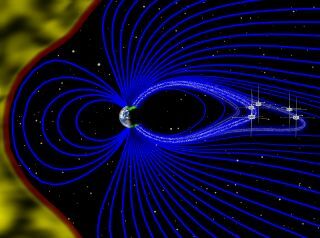 As the solar wind's magnetic field turns southward, Earth's sun-facing magnetosphere contracts inward, while the planet's back end, or magnetotail, stretches outward and away from the sun like a rubber band, according to the statement from NASA. When the overtaxed magnetotail snaps, it starts to vibrate. Electrons near Earth pour down the magnetic-field lines to the poles, reacting with oxygen and nitrogen in the atmosphere to create brilliant auroras. A perfectly placed lineup of satellites and ground-based instruments lets scientists make a direct connection between the two incidents. Aurora images taken from the ground in 2013 with a network of all-sky cameras spread across Canada were used in a new study of the connection between the aurora's and Earth's magnetic fields. The five THEMIS satellites were perfectly positioned to observe the vibrations of one particular magnetic-field line as it vibrated back and forth, the researchers said. By combining the satellites' observations with ground-based magnetic sensors measuring electrical currents during the substorm, the scientists found that the auroras moved in harmony with the magnetic-field line. The field line vibrated in a 6-minute cycle, while the auroras brightened and dimmed at the same rate. "During the course of this event, the electrons are flinging themselves Earthwards, then bouncing back off the magnetosphere, then flinging themselves back," THEMIS project scientist David Sibeck said in the same statement. Sibeck, a researcher at NASA's Goddard Space Flight Center in Maryland, did not participate in the study. Prior to the study, the vibrating magnetic-field lines were thought to guide the auroras, but the effects had not been confirmed. For scientists to observe the connection, the THEMIS probes had to orbit in the right location over the ground-based instruments — and the observations from this lineup were reported in this study. Launched in 2007, the five-spacecraft THEMIS mission is dedicated to understanding the processes behind the brilliant auroras. The research was published in the Sept. 12 issue of the journal Nature Physics.